Now regarded as a classic of the genre, Scorsese’s gangster movie was acclaimed for both the authenticity and the energy of its storytelling. 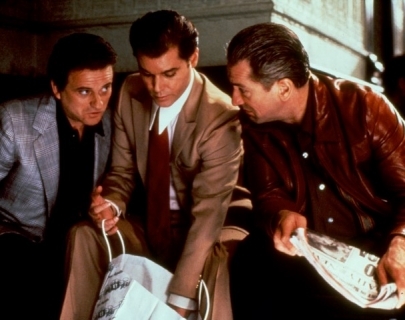 The titular mobsters are Jimmy Conway (De Niro), Tommy DeVito (Pesci) and new recruit Henry Hill (Liotta), who, long before he began doing jobs for Paul Cicero, had always wanted to be a gangster. He’d liked their style, status and money – but wasn’t, perhaps, prepared for some of the stuff he’d have to do beyond the usual robberies, scams and shakedowns. Besides, how much should Henry tell Karen (Bracco) about his life? Performed, shot and edited with terrific expertise, fluency and panache, the film offers a teeming panorama of the Italian-American underworld, an extended ‘family’ riven by secrets and lies, rivalries and betrayals.